Meeker High School senior Kash Atwood made contact with this ball and hit a double in the second game of a doubleheader against the Paonia Eagles. The Cowboys traveled to Hotchkiss on Tuesday to play the Bulldogs in a doubleheader and will host them for another doubleheader on Saturday at Paintbrush Park. 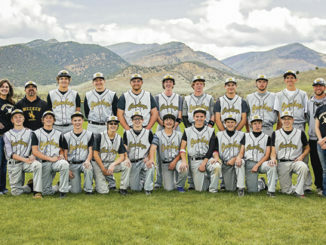 MEEKER I “Paonia is always tough,” Meeker head baseball coach Jason Browning said. 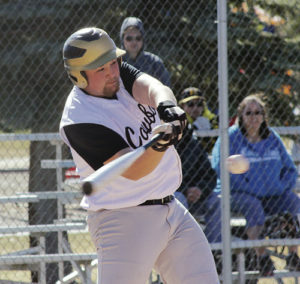 The Eagles were in Meeker on Saturday and won a doubleheader held after a JV game at Paintbrush Park. The Cowboys played in Hotchkiss on Tuesday and will host them at home Saturday. 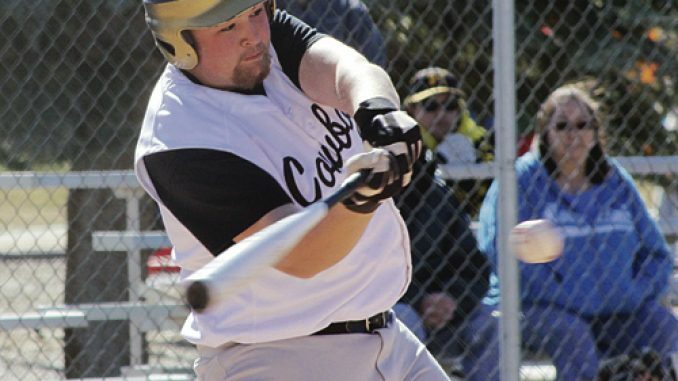 The Cowboys have enough players for a JV team, which also saw action last Saturday and faced the same outcome as the varsity, as the game was called after five innings. Meeker’s varsity is currently 2-4 and Browning said, “We are still OK in the league standings but we have a tough stretch coming with Hotchkiss twice, then Paonia again. The Cowboys lost 14-2 after five innings in the first game against Paonia, then lost 27-2 in the second, after Paonia scored 17 runs in the third inning. “We are focused on getting better and working towards the district tourney,” Browning said. MEEKER I The Meeker High School Cowboys high school baseball team finished the regular season with a 7-11 record, and they will now play in the district tournament.